HWARANG: The poet Warrior Youth is a South Korean television drama series starring Park Seo-Joon, Go A-Ra and Park Hyung-Sik. This Drama series is most popular since it released. The series aired every Monday and Tuesday at 10pm (KST) on Distributor KBS2 channel from December 19th of 2016 to February 21st of 2017. It is Historical coming-of-Age Romance Drama series which will make you fall in love with the Story and its Casts. It revolves around the Elite group of young men called “HWARANG” who are the grate Warriors of the Silla kingdom. “HWARANG” discovers their passion, Friendship and Love in their turmoil of the Silla Kingdom. 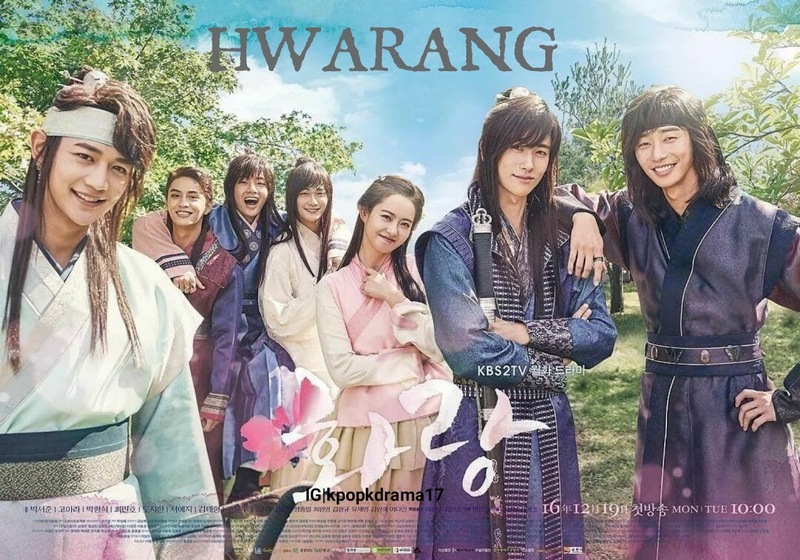 HWARANG: The poet Warrior Youth/ The Beginning is a South Korean television drama series revolves around the Elite group of young men called “HWARANG” who grow through the Passion, Love and friendship in Seorabeol which was the capital of Silla Kingdom. The Elite group of young men in Silla known for their great outward beauties and aristocratic Family backgrounds. They pledge loyalty to the state and are physically, morally and also spiritually trained to protect the Silla kingdom and it’s Royalty. HWARANG kicks off to an anemic start with the brief introduction of its Overwhelming set of characters in the drama. The main cast for this drama is Moo Myung’s character which is played by the actor Park Seo-Joon. He is a Mysterious young man who’s Nick name is “Dog-Bird” because he is dangerous as like a dog and flexible like bird. He lives with his best friend Mak Moon character which played by Lee Kwang-Soo in the small village. Later in the drama Mak Moon’s tragic death urges Dog-bird to assume his friend’s identity as the Half-Breed as Kim Sun-Woo. He wanted to take revenge of his friend’s death and also feels obliged to protect Mak Moon’s Family on his behalf especially his Father and younger sister named Ah-Ro character which played by actress Go Ara. Ah-Ro is a Half-Breed maiden living in the Silla capital. She grows up being self-reliant. She gradually convinced that Dog-Bird is indeed her brother whom she is separated from 12 years ago and also begins to rely on him through the tough times. Sam make-jeong is King Jinheung, who is the faceless king whose Mother who is Queen Ji-So of the Silla Kingdom decides to put him into hiding until he grew up well due to assassination attempts by the Royal Enemies who’s trying to usurp the throne after the King of Silla Died. The Queen of Silla hides the identity of Young Prince to protect the future of The Great Silla Kingdom. Queen of Silla Kingdom provides all rights to the previous King’s Close Friend to gather the Royal Bodyguard for the Future King by planning of recruiting the children of the officials. She wanted him to train them to be Loyal for the future King and the Scared Kingdom. The next episodes of this drama truly focused on the lives of and challenges faced by the Hwarangs from their reluctant cohabitation inside the Hwarang Residence. Dog-Bird also get drag into the Hwarang Residence also he admitted his true connection with Ah-Ro. At some last episodes Dog-Bird found his true identity that he is also the future King of Silla Kingdom. This gives the great turn to the Drama story. In this drama the Justice is uniquely served and the mystery remains until the end. The intense pace is also maintained even when the drama is already nearing its conclusion.